The University will undergo the change making Campus Scan, which is an inventory tool designed as a structured process to assess the change making ecosystem at the institution. A team of knowledge and practice will be created to advance social innovation and social enterprise culture in the UMT. This team will bring the university closer to joining the leading institutions in social innovation education who share the vision that higher education can become the next local driver of social change. A Change Making Competition will be delivered to the university to provide students and alumni with the opportunities and support (financial and technical) to drive change in their communities. A sound performance measurement system will be developed to help the university to compare and contrast the performance of students and alumni in field of entrepreneurship. 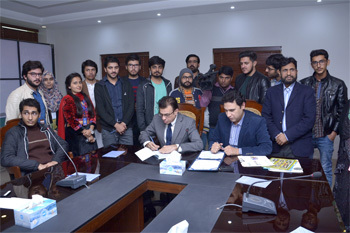 YES Network Pakistan will provide technical assistance to the university in embedding the concept of change making (social innovation and social entrepreneurship) in the curricula and culture of the institution. YES Network Pakistan will help UMT to achieve the status of a ‘Change Maker Campus” in order to recognize its efforts in the field of social innovation locally and globally. UMT will be connected to the leading change maker campuses of the world with a view to build, exchange, refine, expand and strengthen change making building process. YES will motivate UMT students and alumni by having frequent entrepreneurial sessions at UMT and provide them with the technical and financial support. 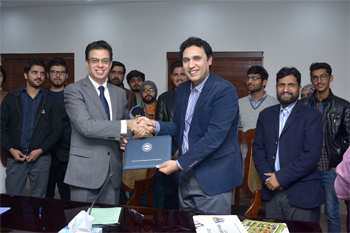 OER also introduced the Center for Entrepreneurship and Innovation (CENTIN) at UMT to YES Network Pakistan. Both will conduct detailed meetings before launching the sessions and change making competitions at UMT through the facilitation and support by OER. YES Network Pakistan was founded by Ali Raza Khan in 2002 to drive first-ever 'Youth as a Solution' movement in the country and get young people started as change makers. It facilitates several thousand young people each year to begin their change making journey. YES creates, activates and multiplies spaces for young people to master change making skills across the country. YES offers a comprehensive package to youth; from inspiration to experimentation; to training and risk-free funding, showcasing and practical support. YES work is featured in more than 30 countries of the world and they have innovated a unique trust-based model to turn young people into change makers after having been tested with over 16000 young people from almost every walk of life.